See a list of all reports developed by the ERAP Reporting Team. If you have questions about the following reports or would like to request access please contact the ERAP Help Desk at eraphelp@ucsd.edu. Note: these reports are best viewed in the following browsers: Internet Explorer, Firefox, and Chrome. This report allows fund managers and other authorized administrators to see data about active awards, whose overall end date is greater than or equal to today's date, within the contract and grant system's award module for one or more investigators. The information contained in this report, specifically for effort purposes reflects what was originally awarded at the time of agreement/amendments with the sponsor. What is investigator X's active portfolio of awards? What was the originally awarded effort amount for investigator X on any given active award? What is the current (i.e., active) portfolio of awards for all of the investigators I serve as fund manager? Which of unit Y's investigators are currently listed in awards running through any lead unit? Note: To view this report, you must hold one of the following ALTNG roles: Department Approver, Department Manager, Department Assistant, Sponsored Projects Office (SPO) Proposal Analyst, SPO Awards Analyst, SPO Viewer or OPAFS Award Analyst. To learn more about these roles or how to request access, please visit the EPD Requesting Access & Appropriate Use page. The information contained in this report reflects what was originally awarded by the sponsor. Which of Unit Y’s investigators are listed in awards running through any lead unit, as listed at the time of award? Read the instructions/ documentation guide (PDF) for details on this report's features. This report allows fund managers and other authorized administrators to see data about active awards, whose overall end date is greater than or equal to today's date, within the contract and grant system's award module to understand the portfolio of one or more units. What is Unit X's current (i.e., active) portfolio of awards that involve Unit X as the lead unit? What is Unit X's current (i.e., active) portfolio of awards that involve Unit X as a participating unit? What is the status of all active awards for Unit X? The primary business objective of this report is to aid investigators in providing information about all active awards as a condition for funding consideration. 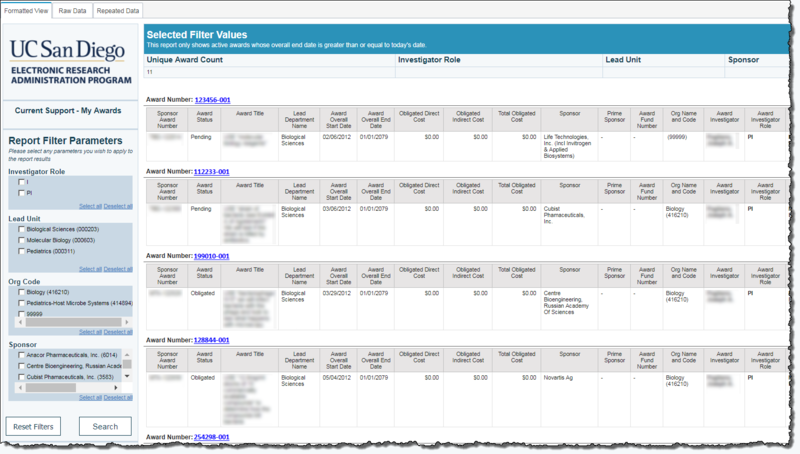 The report shows the logged-in investigator all active awards where he or she has been formally named as a Principal Investigator or an Investigator. What is my portfolio of active awards? What are the statuses of all of my active awards? This report allows fund managers and other authorized administrators to see basic data about pending proposals within the ePD system for one or more investigators. What is investigator X's portfolio of pending proposals? What is the portfolio of pending proposals for all investigators I serve as Fund Manager? Which of Unit Y’s investigators are currently listed in proposals running through any lead unit? This report allows unit heads and other authorized administrators to see basic data about pending proposals within the ePD system for one or more units. What is Unit X’s current portfolio of proposals that involve Unit X as the lead unit? What is Unit X’s current portfolio of proposals that involve Unit X as a participating unit? What is the status of all current proposals for Unit X? What is the current portfolio of proposals for Units X, Y, and Z? Visit the instructions/ documentation guide (PDF) for details on this report's features. This report shows an individual basic data about the pending proposals within the ePD system on which they are formally named as a Principal Investigator or an Investigator. What records comprise my pending portfolio of proposals? 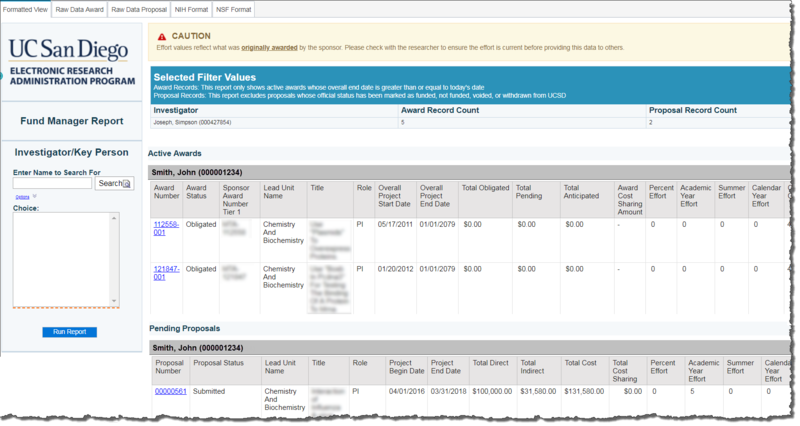 What is the status of all of my pending proposals? This report allows users to find all linking identifier numbers (plus high level details) for proposal and award records throughout the Coeus modules. A user will be able to search for an EPD number, Institute Proposal number or UCSD Award number and find matching identifiers for the other systems, if they exist. Note: To view this report, you must hold one of the following ALTNG roles: Department Approver, Department Manager, Department Assistant, Sponsored Projects Office (SPO) Proposal Analyst, SPO Awards Analyst, SPO Viewer or OPAFS Award Analyst. To learn more about these roles or how to request access, please visit the EPD Requesting Access & Appropriate Use page.Awards Analyst. Read the instructions/ documentation guide (PDF) for details on the report's features. 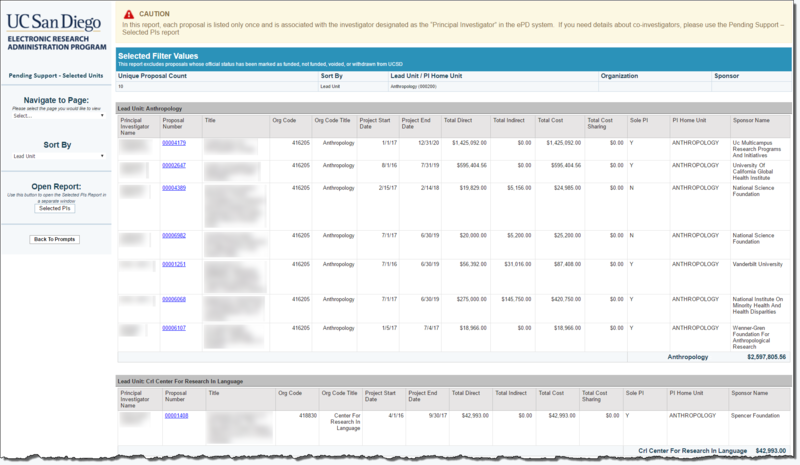 This report shows the sponsor name, code, acronym and categories of all sponsor records that match your search criteria. You can also search for sponsors by UCSD Sponsor Type or Sponsor Category and see a list of which sponsors belong to a given category/type. What sponsor does this code belong to? What type of sponsor is this? What category of sponsor is this? What is the acronym for this sponsor? What sponsors belong to a specific category? What sponsors belong to a specific type? If you have a question about sponsors, find an error in the sponsor list or wish to report a problem with one or more sponsor entries, please contact your sponsored projects office. For additional information, email eraphelp@ucsd.edu or call 858-534-9979.